Anna Birch director and producer from London, UK and Kaethe Fine a New York and London based writer will be presenting excerpts from Wollstonecraft Live!, a multimedia history of Mary Wollstonecraft at the A.I.R. Gallery in February to complement the exhibition Daria Dorosh: The Changing Room and recent anniversaries celebrated by the women's movement in America and the UK. Wollstonecraft has played a major part in the lives of women across the western world. This international film premiere of Wollstonecraft Live! brings the past into the present through script, costume, location and audience participation. Fragments & Monuments conjures up the life and times of this spectacular woman of achievement. The audience will find out how she articulated the case for women's suffrage, wrote A Vindication of the Rights of Men and A Vindication of the Rights of Woman, married philosopher William Godwin and gave birth to Mary Shelley. High-resolution images and film will be projected and DVD's of Fragments & Monuments films will be available. Mary Wollstonecraft lived at a time when it was nearly impossible for women to feel any sense of power or to be the arbiters of their own wills. She emerged from a difficult childhood, persevered, broke norms and sanctions on what was acceptable, set up a school, fell in love with an American, had a child, Fanny, out of wedlock, traveled, conducted business, twice attempted suicide, made for herself a nominal but essential career as a writer, met and married Godwin, had another child, Mary, and died at 38, leaving a legacy she could only have dreamed of. Fragments & Monuments produces a unique form of location-based theatre aiming to unearth and reactivate the stories of women’s achievement, incorporating groundbreaking design and technology to transform hidden biographies into compelling live and mediated performances. To create living monuments which reveal hidden stories of women’s achievements. To further the use of live performance, film and other media operating in real and virtual time. To create, develop and further an ongoing relationship between the living monuments / central protagonist / location / local audience / global audience. Since 1996 Anna Birch has created and produced new performances for locations in and around her home city London, UK and abroad including Holland and Morocco. Her work has been seen at numerous theatres across Britain including the Royal Court and Salisbury Playhouse; festivals have included the Edinburgh Festival in Scotland and SPIT-LIT Festival in London. Her artwork has been reviewed by such publications as Time Out, The Guardian and The Independent newspapers, Theatre Forum, Women and Performance and Total Theatre journals. She has lectured about her artwork and supervises PhD students in institutions such as Central Saint Martins College of Art and Design, London College of Fashion, University of the Arts, London and SMARTlab, University of East London where she is a research fellow. She has been the recipient of a number of grants, fellowships and awards including Awards 4 All arts funding, Royal Netherlands Embassy, and an award from the Royal Court Theatre, London. She is an innovator pushing back the frontiers in performance technology practices with three short films directed by her and a major performance and pedagogy tool for making and analysing new performance works all designed and produced by her. She is Research Fellow in Theatre / Drama at Manchester Metropolitan University, UK and her site-based, multi-media performance company Fragments & Monuments produced the sell out production of Wollstonecraft Live! 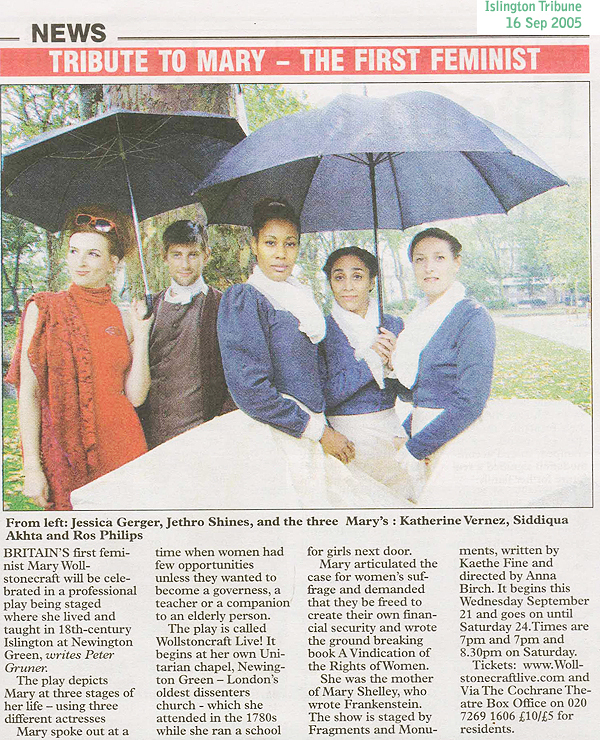 written by Kaethe Fine, Conceived by Anna Birch and Kaethe Fine, directed and produced by Anna Birch. Kaethe Fine began performing at the age of 8, on the streets of New York, in her Gircus (girl-circus). She attended NYC’s High School for Performing Arts, and at 15 appeared in The Chosen, a feature film with Rod Steiger and Maximillian Schell. She holds a BFA in Filmmaking from Purchase College where she made award winning, super-8 short, Clearing which was shown on PBS. She has created videos for her own and others' installations, including NY artist/performer Claude Wampler, and Niels Radtke-Klein. Her first play, Motivation for the Meat of Life was produced in New York at the William Redfield Theater. Other plays (A Factor of 2, Zero Point Field and Vows) have been developed in association with The Labyrinth Theater Company, Ridge Theater and RADA. Kaethe has worked as a videographer, researcher, script-supervisor and editor for independent producers, including James Schamus and Christine Vaschon and has a Masters in Writing for Performance from the University of London’s Goldsmiths College. 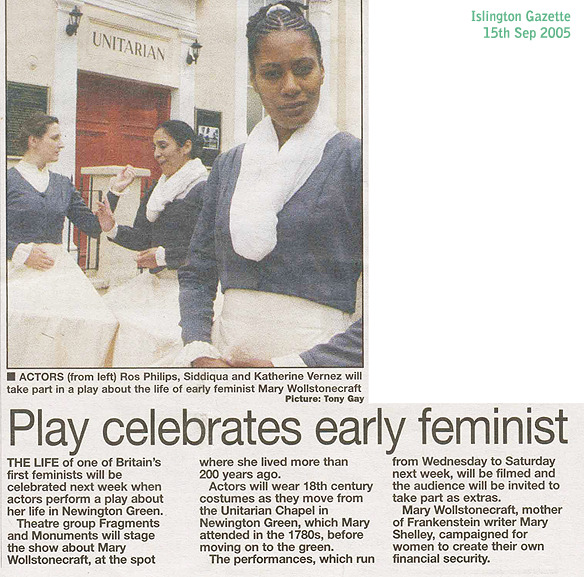 In 2005 she wrote and associate produced Wollstonecraft Live! which was produced in Stoke Newington, London by Fragments & Monuments. Her latest directorial project, a short horror film called Saturday Afternoon, is currently in post-production.